To celebrate the opening of Saturated: The Allure and Science of Color (May 11, 2018-January 13, 2019), Object of the Day this month will feature colorful objects from the exhibition. This blog originally posted in September 2016. When I first saw this wallpaper I had to stop and do a double-take. It is very unusual for an insect to take prominence on a wallpaper design, let along be the only motif. 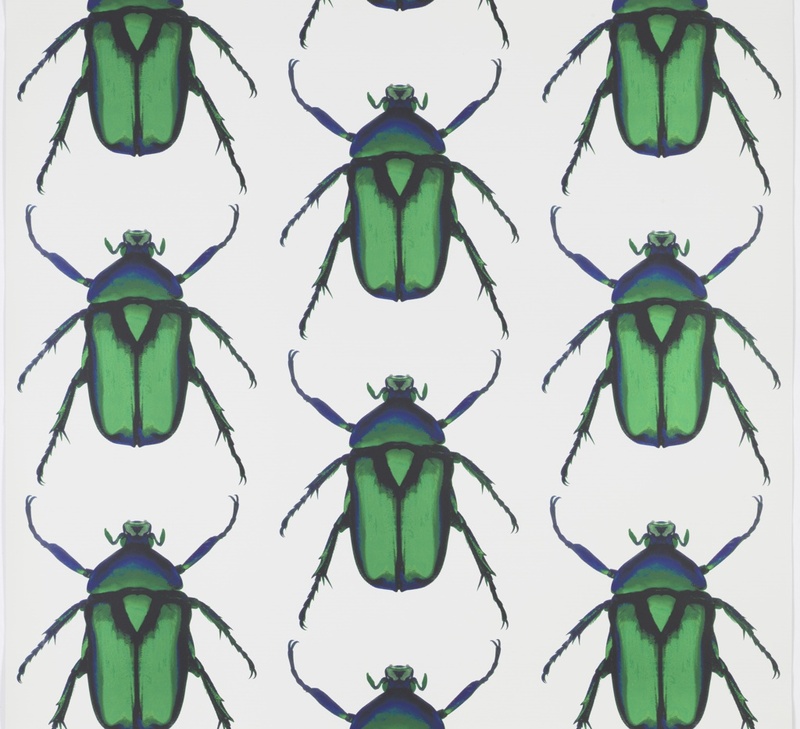 The design consists of a rose chafer beetle, greatly magnified and repeated in diagonal rows; think polka dots with six legs. Rose chafers are only about a half inch long but can be extremely destructive as they feed on blossoms and foliage. And their bodies contain a toxin that can be deadly to birds and small animals. So while rose chafers are not a friend of your garden their iridescent green bodies are quite handsome. It was the beetles’ iridescent quality that fascinated photographer Don Flood, who experimented with printing on Mylar to mimic this effect. If you are of a certain age you may remember the Mylar wallcoverings of the 1960s and 70s, with its highly reflective mirror-like surface. Mylar is back in a big way but is being used in a more subtle manner. In Beetle, the entire background is printed with an opaque white color and you only get a hint of the Mylar when looking at the beetles, which are printed in translucent pigments that allow the Mylar to reflect light through them. This does a beautiful job of mimicking the iridescent quality of the beetle, enlivening the brilliant green and blue of the printed insect. Insects are rarely the main focus in wallpaper designs but are found on some of the more exquisite wallcoverings going back to the eighteenth century. They were used in a more symbolic fashion on neoclassic designs and to heighten the realism of floral designs. One of the first designers to make insects the central element of his designs was E.A. Séguy (French, 1890-1985) who created a series of ornamental patterns for textiles or wallpapers ca. 1927. Greg Herringshaw is Assistant Curator for Wallcoverings at Cooper Hewitt, Smithsonian Design Museum.